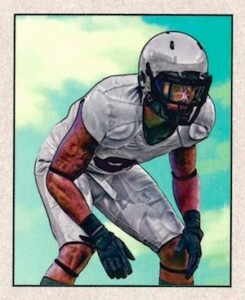 2014 Bowman Football has some of the first rookie cards of the season. Sticking with the Bowman tradition, it's the young players that are the focus of the release. Hobby boxes deliver a total of four Bowman Chrome Rookie Autographs as well as one memorabilia card featuring a veteran. 2014 Bowman Football has different designs for rookies and veterans but both have tons of parallels. On top of that, there are Rainbow Foil and Paper base cards (think of it as being similar to Bowman and Bowman Chrome cards coming in the same packs). Rainbow Foil base cards for both have Silver Ice, Blue, Gold, Orange, Orange Ice, Printing Plates and Gridiron Ice (1/1) parallels. 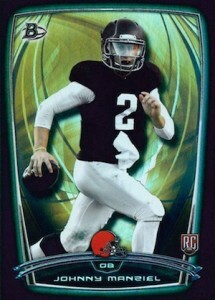 Rookies also have one-of-one Green parallels. The more basic Paper base cards take a similar approach with different designs for first-year players and veterans. These cards come with black borders. Each has Blue, Gold, Orange, Red and Green parallels. On top of that, rookies come with Silver (1/1) versions as well. 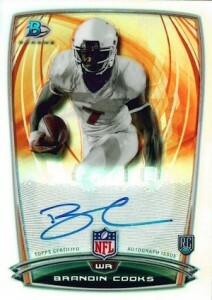 For many, the main draw of 2014 Bowman Football is the early signatures. Bowman Chrome Rookie Autographs are all signed on-card and done on Refractor stock. With upwards of 80 signers, the checklist is vast. And what would Bowman Chrome be without parallels? Rookie autographs have seven levels of Refractor parallels: Blue(#/99), Gold (#/75), Orange (#/50), Red (#/25), X-Fractor (#/10), Prism (#/5) and Superfractor (1/1). In addition to all those are Printing Plates. Parallels numbered to 50 or less can only be found in hobby packs. These aren't the only autographs in the set. Under Armour All-America Game Autographs were made, printed and signed at the 2011 event. Now that players are turning pro, they're headed to packs. They're similar to the AFLAC and Under Armour cards found in Bowman Baseball products. These are inserted on top of the guaranteed four Bowman Chrome autographs. 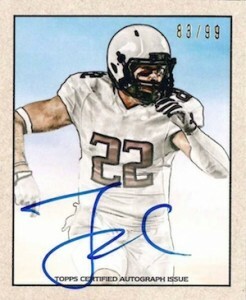 Bowman Autographs (#/25) are redemptions for cards signed by players who attend the 2014 NFLPA Rookie Premiere. Done on Refractor stock, the final cards will have the 2014 Bowman Football design, a photo taken at the event and an on-card signature. Relic Cards use jersey pieces worn by veterans. Numbered parallels include Blue, Gold, Orange, Red (1/1) and Printing Plates. Bowman Mini cards are done to look like 1950 Bowman Football. Inserted one per hobby pack, the set features more than 100 rookies. Collectors can also find randomly inserted autographed versions that are hard signed. Red Ink parallels are numbered to 5. 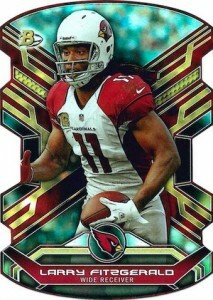 Landing three per hobby box, Bowman Die-Cut cards highlight top veterans with a flashy design. Parallels include Blue (#/99) and Red (1/1). 2014 BOWMAN CHROME DAMIEN WILLIAMS RC AUTO SP ROOKIE AUTOGRAPH!RefractorW Bonus! 75 cards. Inserted 1:41 packs. Extra hit. Inserted 1:246 packs. Good: On-card autographs, lots of low-numbered parallels, 25 cards per hobby pack. Bad: Lack of uniforms for rookies, lack of team logos on autographs, between the paper and the foil there are too many parallels. The Bottom Line: The new football card season is here, but a lot of 2014 Bowman Football looks like the unlicensed sets from other companies put out before the draft. While it’s nice to see all of the on-card autographs from top players this early, the lack of uniforms on the rookies took away a lot of the personality for me. On top of that, the multiple levels of foil and paper cards, each with their own levels of parallels, left me with a feeling of redundancy. The first thing that stands out with 2014 Bowman is how the rookies are shown in generic uniforms. In turn, the players themselves don’t carry a lot of personality or individuality. For me, it’s a turnoff for the product as a whole, especially since the rookies are the major focus. Even worse in this regard are the 1950 Bowman Minis. Not only do you get generic shots, but the design is one that doesn’t have names on the front. The end result is comparable to the amount of personality found in a picture frame on the shelf at Walmart. That being said, the veterans look very solid. The design elements look good and the images are bright and crisp. Sticking with that are the die-cut inserts. I wish that the set was either held back until later in the season or even pushed back a few weeks to allow for shots with rookie uniforms. 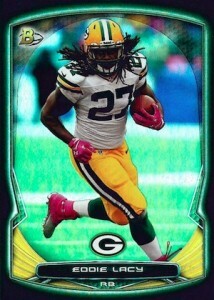 Player-wise, 2014 Bowman Football is strong. The autograph checklist covers the major players and then some. Given how many autographs are per hobby box, this isn’t the worst as many of the players probably won’t be in too many sets. What confuses me is the structure. This starts with putting the veterans and rookies in separate 110-card sets. The picky set builder in me wants the same players but a single 220-card checklist. More troubling is the sheer number of parallels. Like Bowman Baseball, it’s daunting. Separating paper and foil is on par with Bowman and Bowman Chrome going together, although I’m not sure why foil couldn’t be Chrome. I would have preferred if foil was merely a basic parallel and that it didn’t have all of its own parallels. The Bowman name and on-card autographs give these more widespread appeal than many other early-season releases. 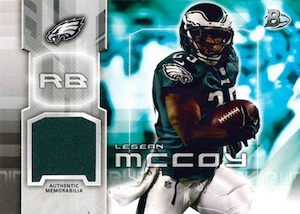 However, as sets start coming out with rookies in full uniforms, it’s likely a lot of collectors will move on. One of the benefits of so many parallels is that most hobby packs come with at least one numbered card. A lot of these are fairly high numbered but a box should have a couple that are legitimately rare. While I understand the excitement of getting the first NFL cards of the year, by not using uniforms or logos for rookies seems like a bit of a waste of a license spot. The license is supposed to be an advantage but putting out generic cards like these rookies are put them on a level playing field. I get the logistics and reality behind the decision, but I’d much sooner wait a month or two to get something that looks and feels right. Wow, I gave you and your team five stars for having this information ready the day after Thanksgiving! You all work way too hard! But I understand. I played jazz for over 30 years. I got to travel and receive a really fantastic income. For me, just playing jazz was my dream and I loved it. It was my passion. To get payed was just icing on the cake. Keep up the great job, keep the passion alive, and I’ll definitely purchase some ’14 Bowman when it debuts. Toshi � Thanks, Toshi! All the best to you and your family over the holidays! Any idea when the check list will be released? I can’t wait to buy a jumbo box. Zach � Like days before it comes out. Over 100 autographs???? Come on Topps this is beyond overkill. I’m fine if these guys are all first 3 rounds but 25% of the hits are players not even on an NFL roster!!!!! Really they couldn’t put Davante Adams WR GB Packers in their base rc set but they have so many guys who didn’t even get drafted. Thanks alot. A 2nd Rnd WR who caught over 20TD passes last year doesn’t make your cut. His only auto’s are the /25 from the RC premiere. Won’t be getting any of my $$$ I’ll wait for a real product to come out. I have a mack nfl auto redemption. Does anyone know the.number of this? Allen � It’s possible. It could also be that they’re short prints and none have popped up in the first couple of days. I understand some of the issues collectors have with first of the year products but everyone must understand that these cards are entry level items. 2014 Panini Score and 2014 Topps Bowman Chrome definitely fall into this category among many others not mentioned here. Personally, in my humble opinion, I don’t take these type of products too seriously! As it is an entry level product, I treat them so. I normally forgoe the hobby releases and go to a big ticket merchant and purchase blaster boxes of first of the year cards. This concept allows me to have fun, enjoy such an inexpensive product and not worry about it’s book value. Ultimately, placing these cards in an album suffices for my taste. I’ve only opened a half blaster box yet was pleasantly surprised by how many hits and or inserts were pulled from this break. I’m excited to see what the other half holds. The base cards are similar with last years design as this presents a; “I’m not too excited about the base cards” syndrome. The colored inserts followed 2013’s product but the difference maker as well as a fresh insert was the 1950 Bowman throwback of Bryn Renner, a relic card of Julio Jones, Colin Kaepernick foil die cut, and a gold foil Jason Verrett numbered to 399 and a orange Jordan Mathews numbered to 299 parallel respectively. As for the blaster box, it was a nice break, decent base cards, great inserts that were the difference maker in this product, and finally the ubiqiutos standard colored parallels. Will another purchase be necessary? No. I’ll be saving my funds for the National Card Show here at the IX Center in Cleveland, Ohio and looking forward to my all time favorite go to product of Certified, Elite, Chrome, and Platinum! With a stronger rookie class to look forward to compared to last years 2013 Draft Class disappointment, we as collectors have something to look forward to. Liking this set somewhat..question though…the redemption cards…what are these numbered to? I saw a Landry on Ebay that said #/5. I just can’t find that information anywhere to verify it. I like this for the beginning of the 2014 collecting class. Good cards to get graded if you get a chrome hit. Ryan – I’ve not seen ANY Cody Latimer autos pulled. Is it a super SP or can you confirm that it wasn’t produced? Thanks! I pulled a redemption jalen saunders nfl bowman autograph that you do not have on your list any idea how many are made? I might rate Bowman better if it were not for all of the subsets. Will someone please tell Topps enough is enough. They have 13, count them 13 subsets on the base cards alone. Topps has heard 13 is an unlucky number, right. This product would be much better with only about six or seven subsets. Wow, I guess the Dallas Cowboys only drafted one player this year and Ahmad Dixon is his name, a 7th round pick. Why did Bowman leave off Dallas’s 1st round pick, Zack Martin or their second round pick DeMarcus Lawrence. Someone must have drank the coolaid at Topps during the selection period. Pulled a Orange Chrome Bishop Sankey(20/50) refractor along with regular Chrome autos of Bradley Roby, Devin Street, and Andre Williams. Also got several rookie parallels including a gold AJ McCarron refractor and Red Lache Seastrunk refractor. The relic was a regular Deandre Hopkins. For the price($100), its worth buying a box or two. I plan on buying at least one more. Got one box and liked the product!!! Bowman always does the rookies proud. Lucked out and got a Damien Williams auto x-fractor /10 and a Conner Shaw auto . Will probably get another box and try to build a set. I have bought several boxes and am overall very pleased with the hits that I received. I have built the Rookie base card set twice still working on the 2nd Veteran base card set. I was wondering thought can anyone tell me what the difference in the white bordered and black bordered base cards are. Jim � Black are a parallel set. Over all designs are nice :) I like the rainbows and the die cuts but most of all the chrome rookie autographs! Havent’ landed one yet but I will! Ryan, have you seen any variations in the cards? Reason I ask is that I have a couple like#18 I have Antonio Andrews RC on one and Denard Robinson on the other#18 and $15 I have Ed Stinson RC and Aaron Dobson on the other…. any info would be appreciated! Thanks! Keep up the good work! Dave � There are actually two separate sets that make up the 220-card main set. There is a Base set (#1-110), and a Rookies set (#1-110). The numbering overlaps so these cards you are talking about are not variations. Anything with the “RC” tag is from the Rookies set and anything without it is from the Base set. I’m confused about one of the NFL Bowman Auto redemptions. It says that the player will be in their NFL uniform taken at the NFLPA Rookie Premiere. I have a redemption for C.J. Mosley and I don’t think he was there at the Rookie Premiere. I didn’t see him on the attendance list or in the group photo of all of the attendees. Any help on this would be great. Thanks. The generic uniforms and lack of team names on the autos are disappointing, but if that’s what was necessary to give us on-card autos instead of stickers then I’m all for it. Overall, the card presentation is very nice and with 5 hits per box it is reasonably priced. Three of my hits were no-names, but a Joe Flacco relic and a gold auto rookie refractor of Jordan Matthews more than made up for it. I also pulled a Matt Ryan silver parallel, a very cool blue parallel die-cut of RG3, and a red Sammy Watkins refractor numbered to 199. Nice! Haven’t opened any hobby box’s but I have opened MANY packs. I must say, I pulled a 1/1 Jimmy Garoppolo GREEN Rainbow!!!! Pretty stoked at how lucky I got, now i just need ol’ Jimmy to actually pan out. Yet to pull any Autos, Dies or Refractors though. Will continue to open packs of this set. 2014 Bowman Factory Sealed Football Hobby Box Jimmy Garoppolo AUTO ?? 2014 Bowman Chrome Factory Sealed Football Hobby Box Jimmy Garoppolo AUTO ? ?